An Interview With 2004 Nationals Overall Women's Champion Gina Davis. Our interview today is with Gina Davis, who was the overall women's winner of the 2004 Nationals. She is very inspirational so continue right here for some great information from a pro. Power, strength, and a passion for the sport of bodybuilding, epitomize the walking contradiction that is the 2004 National heavyweight and overall champion Gina Davis. As far as female bodybuilders go, Gina is big at an off-season weight of 200 plus pounds. Yet, Gina also has a feminine quality that nicely complements her massive muscles. From a young age, Gina was impressed with large muscles. Her idol was none other than the legendary Corina Everson. Having decided to give bodybuilding a shot 14 years ago, Gina, blessed with great genetics, quickly developed her potential to such a degree she won overall at her first NPC contest nine years later. Today, Gina contemplates a long, successful, career in a sport she feels will benefit from having her among its ranks. In 2006, Gina will enter her first pro shows as a lead up to her ultimate goal: Ms. Olympia. Gina truly feels she will one day capture bodybuilding&apos;s most coveted female prize. I, for one, will not argue with her on this point. I spoke with Gina recently and she shared her story with me. [ Q ] Hi Gina. Please provide some background on yourself. I am 5&apos;5". 200 off-season wt. 156 contest wt. 2004 NPC Nationals - 1st Heavyweight, Overall Winner, and New IFBB Pro! Gina Davis, Off-Season & Contest. [ Q ] Where are you from, and what got you started in bodybuilding? My home is Texas, but I now reside in Oklahoma. I started bodybuilding in 1990 and waited 9 years to do my first contest. I have always been athletic and naturally gravitated towards bodybuilding. I admire muscular physiques, be they male or female; they epitomize strength, dedication, and passion for the pursuit of the "best" you. [ Q ] You won the NPC nationals in 2004. Describe the feeling of winning this show. Describe the build-up to this show. Never have I worked harder for something in my life. I became pretty ill two weeks before the contest with an inner ear infection, which caused intense dizziness and nausea. Somehow I made it through and couldn&apos;t have been more thrilled with the outcome. Gina At The 2004 Nationals. My ace in the hole was working with my new trainer, Howard Huddleston in Oklahoma. He is simply the best in the business. My training was nothing short of torturous for an entire 20 weeks. My starch carbs were very limited and consisted of rice and oatmeal only. My protein source was chicken and plenty of veggies. I did 2 hours of cardio per day on a stepmill 6 times a week. That had to be the worst part - I hate cardio! Well, I was planning for my first pro show to be the Ms. International in early 2006, but I tore my left biceps tendon in April of this year preparing for that show. That set me back after having to rehab post-surgery. We are looking at the calendar now, and if all things are back to where they need to be, we will pick a show probably in mid-to-late 2006. [ Q ] How do you feel you will go on the pro circuit? What have been some of your experiences as a pro so far, bearing in mind your injury of course? I think I have what it takes to establish a more positive image in the sport. In terms of placings, the goal is to be Ms. Olympia one day. A Positive Image In The Sport. Sounds cliche, but I believe I can do it. My experiences as a pro have been limited due to my injury. All of the well wishes and support have been overwhelming and I am truly grateful. [ Q ] What are some of your better qualities? I am a very giving person. I am also very approachable, intelligent and witty (or I think I am anyway. lol!). My loyalty to my family and friends is unparalleled. I would go to the wall for the people I care about. Discipline, intelligence, and a great sense of self. It&apos;s disheartening to hear of a promising bodybuilder who lacks the self-confidence to really achieve their goals and dreams. We all know real champions are those who push their physiques to the limitpr. Their success can be isolated to one point. Discipline! [ Q ] What has been your greatest moment in bodybuilding Gina? Absolutely, without a doubt, winning overall at the 2004 NPC Nationals with my Houston Crew, my OKC Crew, and my family there to share in my joy. [ Q ] What is your strongest muscle group (from an aesthetic standpoint) and why? Earlier in my career I would have said "biceps", but now it would have to be legs. They have really grown and taken on great shape which is why my upper body has some catching up to do since my injury. Yes, I help Howard at his gym &apos;Body Tech&apos; in Oklahoma where I am also a personal trainer. My educational background is in Biology where I excelled in anatomy and physiology. My new business venture is called "PROLOOKS" and involves helping ladies with hair and makeup, tanning, and posing. I am very excited about it! Make Yourself Up: Tips & Tricks For Female Competitors & Models! As a female physique competitor, proper make-up selection and application is one of the most critical aspects in one&apos;s presentation. [ Q ] There has been some negative press of late concerning the future of Women&apos;s bodybuilding. What are your feelings on the future of Women&apos;s bodybuilding Gina? I think everything in life is cyclic, as history repeats itself. We will continue to compete and one day flourish. I have to believe this. As long as I have the "love" I will continue to compete. I Will Continue To Compete." 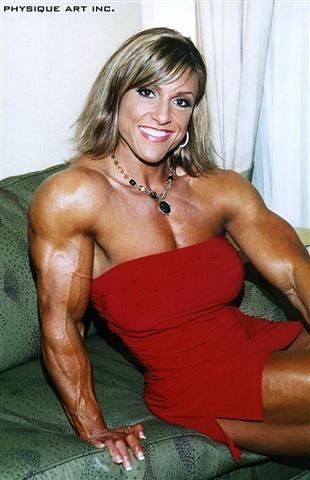 [ Q ] What tips would you give a woman who wants to become a top bodybuilder? Find a successful trainer who specializes in preparing females. Stay true to yourself and never sacrifice your health for a trophy. [ Q ] What is your view on supplementation? Which ones do you use and why? I am bad about not using any supplements in the off-season. I only use protein powder. Come contest time, I utilize multivitamin/ mineral, glutamine, BCAA&apos;s, and protein powder. 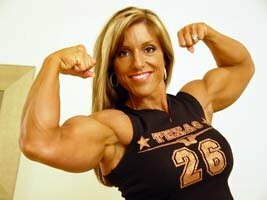 [ Q ] Who in women&apos;s professional bodybuilding do you admire, and why? I admire Betty Pariso for continuing to fight our "battles" as our female representative. She has her work cut out for her! The "uniqueness" of it. The fact that not everyone can do it is intriguing to me as well as the day to day accomplishments in the gym. The "Uniqueness" Of Bodybuilding Is Very Attractive. [ Q ] Describe a day in the life of Gina Davis. I am a lifelong insomniac, therefore I stay up late (like 3:00am) and wake at around 10:00am. I jump on the Stairmaster for 45 minutes as I watch a pretaped episode of Dr. Phil. Once finished there, I shower, pack my meals for the day and head to Body Tech Gym. I work until around 7:00pm when I have the distinct pleasure (hah!) of being trained by Howard until 8:00pm. We close the gym at 9:00pm and head home. Shower, dinner, computer work, etc.. then bed very late once again and repeat! [ Q ] What are your long-term goals? To be Ms. Olympia of course! Beyond bodybuilding, just to be happy in whatever endeavors I choose. [ Q ] Thank you for your time Gina it has been my pleasure talking to you. Is there anything more you would like to add? Off-season: 200 Lbs., Contest: 156 Lbs.